This card was extremely difficult to photograph. However, it was super simple to make! I started with a Basic Grey card base. I sponged on some of the new Platinum Shimmer Paint (pg. 27 of the Holiday Mini Catalog). 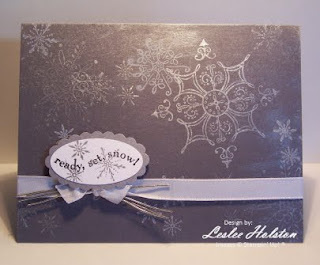 The snowflakes, all from the Serene Snowflakes set, were stamped in the same Platinum Shimmer Paint, Frost White Shimmer Paint, and Whisper White Craft ink. The shimmer paint was applied to the stamp using a sponge. "Ready, set, snow!" is in the Best Wishes & More set. It is stamped in Basic Black craft on Whisper White cs which I punched using the large oval punch. It is layered onto a piece of Brushed Silver card stock punched using the Scallop Oval punch. 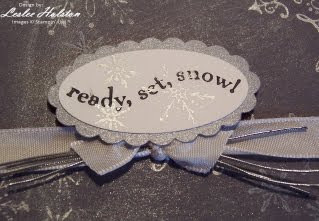 A few more flakes stamped in Platinum Shimmer Paint ties it all together. The ribbon is Whisper White Taffeta. I slipped in a few pieces of the Silver Elastic Cord. I love this new Shimmer Paint. It really does shimmer in real life. That's why I had such a difficult time getting a decent picture of this card. The light hits the card just right and the shimmer is all you see. It really is a beautiful treatment. I will certainly be using this product often this holiday season. So, did you notice the large snowflake? This is how it looks...unaltered. I used it in a very different way in this previous post, Metal Scroll Inspired. Check in tomorrow for yet a third way to use this snowflake! This has really been a fun flake to use. Fun flake...it's even fun to say! I just love snowflakes!